OpenSecrets.org is the website of the Center For Responsive Politics, a non-partisan organization which tracks money in U.S. politics, primarily using public records. The site says the organization is trying “to create a more educated voter, an involved citizenry and a more transparent and responsive government.” The website has several sections with various information about election campaign donations and spending, federal lobbying and other information on money in national politics. 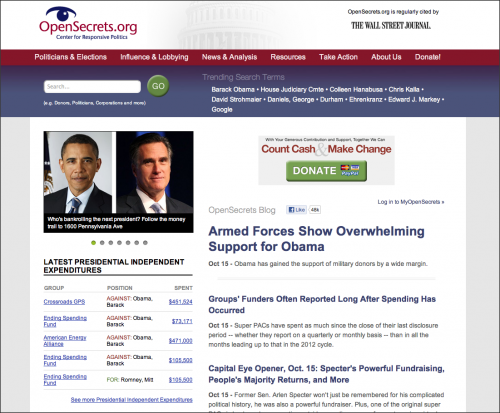 The home page of OpenSecrets.org has a top header with the site logo, than a navigation bar and a prominent search bar. Below the top elements, the page features the organization’s latest blog posts, as well as recent election spending data. The page also prominently features social media links and an iPhone app. Beyond the home page, the site’s navigation can be a bit clunky. There are so many different datasets that the navigation is not always intuitive. The audience is people who are highly politically active or interested in politics. In addition to activists and concerned citizens, the site appeals to journalists looking for information about a particular person or practice, as well as people who work in politics who want to keep tabs on what information is available. The organization’s mission is to improve government transparency by making information about money in politics open and accessible. The Center For Responsive Politics is a non-profit, and solicits donations through the site as well. The home page has a large section with icons linking to Tumblr, Facebook, Twitter and YouTube accounts as well as an RSS feed. Most other pages have large links to Facebook and Twitter. The blog also has sharing links and uses Disqus for comments.